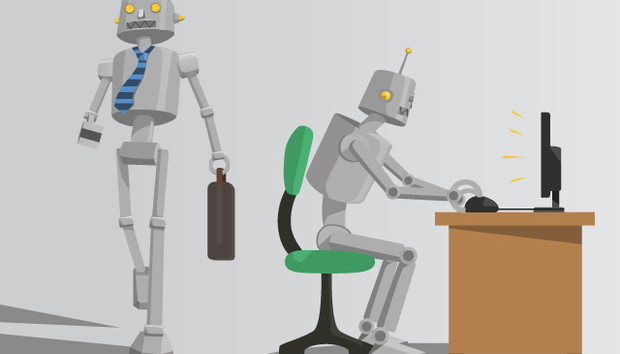 A recent study by Deloitte and the University of Oxford predicts that around one-third of UK jobs are at risk from automation in the next 20 years. "Technology, automation and robotics will cause a significant shift in the UK labour market in the next twenty years, with one-third (35%) of existing jobs at risk of being replaced according to research carried out by Deloitte with Carl Benedikt Frey, of the Oxford Martin School, and Michael A. Osborne, of the Department of Engineering Science, at the University of Oxford." The report goes on to break down the figures for the UK, showing that those workers earning less than £30,000 per year are at much greater risk than those on higher salaries, and that London is less likely to be affected than other parts of the country, due to the capital's relatively high proportion of skilled workers. The pudding is a little over-egged on that score, though. The ‘at risk’ jobs percentage is 35% UK-wide, 30% for London – hardly a dramatic difference. Although the report focuses on the UK, it's not hard to see similar scenarios playing out across the developed world. Automation, a broad term that encompasses computers and all types of robot, is encroaching from all sides. Whether or not this is a good thing depends entirely on your position in the corporate food chain. For example, if the time to market for your company's new product has just been reduced because the data-processing routine has been massively simplified – and cheapened – by a clever piece of semi-AI database manipulation software, no doubt you're pleased. On the other hand, if your data-processing job has just been eliminated thanks to a clever piece of semi-AI database manipulation software, you're probably not so happy. There are two interesting points to draw from the Deloitte study. The first is the time-scale: 20 years. Without meaning any disrespect to the report's authors, this seems optimistic. Unlike events in the real word, technological innovations tend towards the exponential rather than the linear. A quick look at the social change brought on by technology in just the past five years implies that even the next decade could see things shaken up dramatically. But the timing is mere detail. The second point is more important: how should we respond? One implication of the report is that businesses should – and have already started to – create more highly-skilled positions to replace those that are 'lost' to automation. Although that's a logical response, it seems unlikely to be an egalitarian one in the long run. Regardless of any improving education levels, some people will be left behind. Their abilities will be sidelined once machines can match them for a much lower operational cost. Re-training can only go so far. Ask a coal miner what happens when an entire industry skills requirement vanishes almost overnight. Automation won't suddenly stop after 20 years, of course. It will simply move further up the corporate ladder as the tide continues to rise. So, 35% of jobs in 20 years, maybe 75% in 30 years. Eventually there will be little requirement for humans anywhere in the workplace – at least the workplace as we know it today. This could potentially be a good thing. Ever since the dawn of the industrial age we've been told that one day humans will live a life of leisure, our every want and need met by machines and computers, leaving us free to pursue more intellectual and creative pastimes rather than engaging in tedious, repetitive work. If the fruits of automation were to be distributed fairly across the population, this report might herald the arrival of the new age of leisure. Recent history – in fact all of history – tells us that's unlikely to happen, unfortunately. The rewards of automation tend to go to the owners of the machines, not the workers they replace. This isn't to say that society as a whole won't benefit from increasing automation, but governments will have to flex their muscles if the gains are to be fairly distributed. In some countries that will happen, in others it won't. The UK doesn't rank too well in tables of wealth equality, so the chance of the dispossessed 35% being gainfully re-employed through government initiatives seems low. Maybe that won't matter. New types of 'job' are being created all the time, jobs that didn't exist even a decade ago. Many of those are hinting at a more leisurely future. Engineering jobs replaced by YouTube stardom and online gaming careers? It might seem trivial today, but if all other needs are met, the provision of entertainment services is an obvious direction for a post-automation economy to take. Nobody can be sure what the next 20 years of automation will bring. But this report is just one more indication that they will be very different to the previous 20.